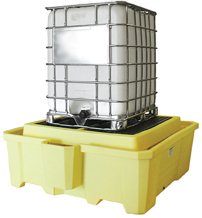 Protect your totes and prevent contamination in the sump area when you store IBCs outdoors. Keep rainwater and debris out of your IBC Spill Pallet. If you store IBC 2000i-Spillpallets outdoors, use a Tarp specifically designed to fit ENPAC's Spill Containment products. 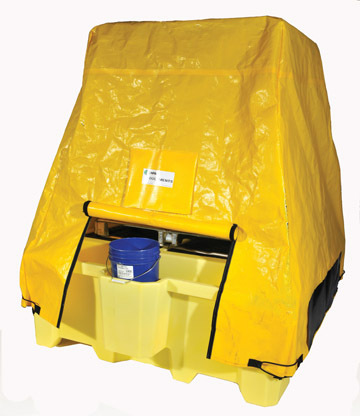 These Tarps prevent contamination of totes and the sump area and allow for easy visual inspection. Quick, easy way to protect pallets outdoors. Tarps are made with an elasticized bottom with adjustable straps. UV-inhibitors resist the effect of weathering. Constructed of High Density Polyethylene fabric. Attached document pouch for holding chemical information, MSDS and other documentation. All freight quote are estimates only and do not include fuel surcharges that change daily. Actual rates may vary.